Fast fashion, plastics, synthetic micro-fibres - the current news agenda is full of stories explaining the negative impact our buying habits have on our environment and planet. So there’s no better time to challenge the norm and consider how we can use natural fibres more widely. 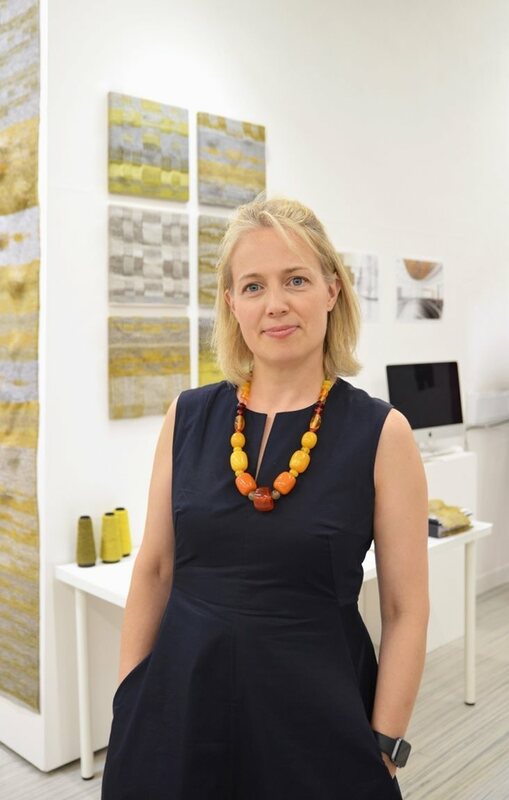 This month we talk to Caroline Hodgson about her plans to use woven British wool in wall panels and installations for the built environment. Having originally trained in Textile Design and Management, Caroline has recently completed an MA in Textiles. With over fifteen years' experience working in Product Innovation and Buying Management roles for global design led brands such as Habitat, Kangol, Paul Smith and The Conran Shop, she is now running her own Consultancy business. Tell us about your ideas for using British wool in new ways. I’m developing a collection of three-dimensional materials, created using British wool, and designed to bring multiple benefits to the built environment. I’m combining interior design with textile technology, supporting health and wellbeing through the natural benefits of British wool as a fibre. Therefore my collection is functional as well as having a design aesthetic. Sustainable textile manufacturing is a real passion of mine, and I’m particularly interested in how innovative design strategies can reduce environmental impact in the long term. Why do you choose to use wool? The use of wool in domestic and public buildings is increasing, as architects and interior designers gain a greater understanding of its properties - inherently flame retardant, along with proven ability to improve air quality and reduce noise. I also love the fact that British wool is sustainable in every way. Sheep regrow their fleece every year, wool can be recycled, and it’s biodegradable and can be used to create organic fertiliser. British wool products also last longer, and need less cleaning, which mean less waste to landfill and less harmful chemicals for our environment. Buying British wool also supports our local farming communities, who in turn help maintain our beautiful landscapes. Textiles definitely runs in my blood. I am very much inspired by textiles that utilise traditional skills and craftsmanship combined with new technologies to create beautiful and functional products. My husband’s family were originally mill owners in Bradford and my mother-in-law also bred Wensleydale sheep which has helped to inspire my love of wool and its many amazing qualities. I am delighted to have received the recent recognition and interest in my work. My ideas for using British wool in the built environment were the focus of my MA at the University of Huddersfield for which I have just received the Chancellor’s award. I’ve also recently been awarded the Worshipful Company of Woolmen and the company of the Merchants of the Staple of England Wool Innovation Prize.